During an interview with Esporte Interativo from Brazil, Marcelo opened up about his future at Real Madrid, the Juventus option and Cristiano Ronaldo. One of the main concerns for many Real Madrid players as of late is Marcelo Vieira’ future in the club, they feel like he may end up leaving to play for Juventus in the near future. There have been several reports that talk about him being overweight, him missing Cristiano Ronaldo since the Portuguese forward left, and mostly about his possible transfer to Juventus. It was evident that Marcelo needed to speak in public about all these topics, something he did with Brazilian journalist Tatiana Mantovani who is also a good friend of his. In past occasions, she has conducted more interviews with Marcelo and gotten exclusives for Esporte Interativo and other networks. The player has a special connection with her and she is the one who usually breaks the exclusives about the Brazilian left-back, it was obvious that he wanted a safe place to talk about all these hot topics that have been more regular lately. Marcelo’s main interest was to let the public know that he is very happy at Real Madrid and he doesn’t think about playing for any other club at the moment. 🤔 ¿Se irá del Madrid? However, Marcelo is also aware of how Real Madrid can treat its players sometimes as he saw the treatment his friend Ronaldo got from president Florentino Perez. The Brazilian left-back has already been slightly relegated to the bench and youngster Reguilon has taken his place in recent matches, Marcelo knows that nobody is absolutely essential in any club and he knows that his journey with Los Blancos could end sometime in the future. The Brazilian has been a Real Madrid player practically all his career, he is the natural heir of legendary Roberto Carlos in the same position but he has always struggled to play his defensive role in the squad. However, this player is arguably one of the best left-backs in the world when he is asked to go on the attack. 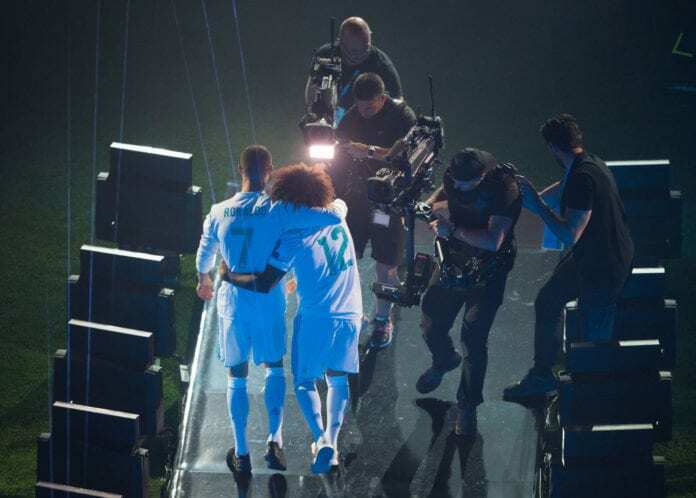 During his best moments in Real Madrid, Marcelo always made a great pair with Cristiano Ronaldo on the left flank and both players knew how to connect at all times in the benefit of the club. Now that the opportunity has presented itself for a possible exit, Marcelo won’t hesitate to leave if the club wants him to. When asked about the rumors linking him to Juventus, Marcelo responded: “I’d also like to know where are these rumors coming from because it’s not normal,” Marcelo said in a fragment of the interview picked up by Diario AS. “If I am on the list of possible exits I don’t have a problem, all they have to do is pay me and I will leave. I trust myself, I trust my work, but I will leave if the day comes when Real Madrid doesn’t need me anymore. But I am pretty sure that I won’t be fired,” he added. In another part of the interview, Marcelo revealed the exact moment when Cristiano Ronaldo told him he was leaving Real Madrid. Why do you think Real Madrid may not want Marcelo to stay at Real Madrid anymore? Please share your opinion in the comment section down below.